So I got an email from the Green Moms Carnival and it was about the holidays and the commercialization of them. There were some great tips/ideas on how NOT to make it commercialized and plastic and get back to the true meaning of the holidays. Of course it got my mind working. I do also love to give, but sometimes, in years past, I have felt so overwhelmed with the thought of “buying” just to buy and I just hate that feeling. I like to give meaningful gifts or something handmade (which I’ve been trying to do for the last couple years). It just gets so overwhelming with this crazy buying frenzy energy that is in the air. I live in a smaller town, so there is no mall or major stores around so it’s pretty nice I feel a bit sheltered from the frenzy – until I drive to work (which is in a bigger town). So I have vowed to buy only handmade or local for the holidays. I have also made a lot (jams, sauces, kahlua, etc.) so I plan on giving those as presents. I would like to make a couple more handmade presents. But, my point being, I am not going to get caught in a frenzy and I’m going to support the local guy. I am the local guy, I will be in a craft fair in November and am trying to locate a few more – so hopefully I will be supported by my fellow “locals” and tourists (I’m not picky). Etsyis a great place to buy handmade. You can find anything and everything on there. I just bought Saige the cutest hat and I feel good that it didn’t come from a retail store. Even if you don’t buy everything, even just one item, start small, find a local craft fair or local boutique and support someone instead of a large corporation, especially with the what’s going on in the economy. The big guys are taking off with the money while the rest of us suffer, stop giving to the big guys and help out your small local businesses. Remember what the season is about, getting together with friends and family, remembering old memories, making new memories and being thankful for each other. So don’t let the commercialism of the holiday season get you, fight back, don’t give in – it feels good to buck the system! Today I had to go to the “mall”, not a big fan of the “mall” but I needed to get something there and I was in the area so I detoured to the “mall”. (I have it in quotes b/c Doug and I usually say it in a certain tone- anyways) I always leave with such a weird feeling, the first being a feeling of filth – not really crazy about the “mall” clientele and it just always looks dirty and second it’s this weird anxious feeling b/c there is this energy in the air of frenzied shoppers just buying to buy something. Especially now, with the economy, I noticed most all stores had some kind of sale going on and people were just scooping it all up. So my point being…. I have really been focusing on buying handmade and/or local. This particular purchase today was lingerie (for my cousins bachelorette party) and there just wasn’t anything in our little, wine country town that screamed bachelorette party (not that I was looking for something totally sleezy) but something sassy. So I succumbed to the “mall” and found the item I was looking for. I let myself wander every so often, and wouldn’t you know it the day that I do, what should I find in my email inbox tonight? But a new “Green Mom Finds” – “Big Green Purse” Book – a book about shopping with an eye for environmentally-safe, socially responsible products and services. And it teaches about how you can use your dollar wisely when it comes to purchasing eco-friendly, fair-trade items. So after seeing that it just reiterated my desire to continue to try to buy local and/or handmade when buying presents. I can say more than 80% of the time I shop local/handmade for my family and I (we love thrift stores, consignment stores and garage sales – even Ryder has learned how cool garage sales are!) But when it comes to presents I sometimes fall back on the “convenience” of going to the “mall” or another retailer ( I hate admitting that). So I am trying to make a vow for the upcoming holidays to either make the presents myself (I do have a lot of canned goods now that will be given as gifts), or buy from another local crafter or the thousands of wonderfully talented artists/crafters on Etsy. Check out Green Mom Finds– subscribe to it and get daily emails about great green items. Try to buy local whenever possible and handmade, support your local artists. This holiday season seek out some local craft fairs or check out Etsy and if you can’t buy everything, maybe just one item (more would be good, but you have to start somewhere). 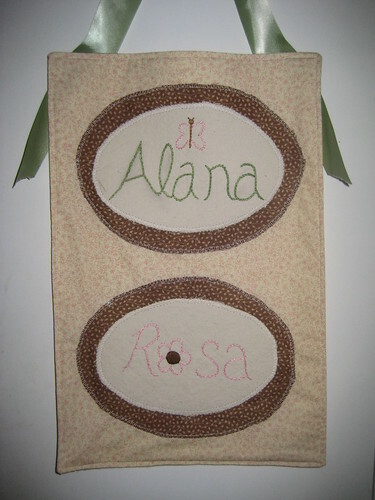 I haven’t been blogging b/c I was asked to make a baby present for a friend who had a shower to go to today. So I’ve been working on a name sign for the gift. Kinda like the one I made for Saige – just smaller. I love how it turned out. My friend gave me no restrictions – she told me the name and the colors of the nursery and of course with the fabric hording that I do, I knew I could find something in my studio. So, I hope the mama to be is happy with her gift. I certainly enjoyed making it. I have set up shop on etsy. It’s not completely down but I have uploaded some of the tshirts. I just need to add some more of the items I am selling and finish up the “appearance” of the shop. But what I have up is ready for sale. So check it out and pass it along to everyone you know. I hope to be adding more items once things settle down on the homefront. I foresee some sewing happening in the upcoming months.